In the dark hospital room lies a present for Soohyun, a dying cancer patient. 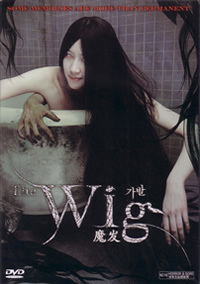 It is a beautiful wig, which Jihyun has prepared for her. Admiring the beauty of the wig, Soohyun slowly puts it on. In no time, the reflection of Soohyun in the mirror transforms into an attractive woman full of vitality, and a mysterious power falls on her. Jihyun feels uneasy with Soohyun’s mysteriously rapid recovery from the day she puts on the wig. Soohyun now seems to have become a completely different person and her attitude toward Jihyun’s ex-boyfriend Kiseok is not quite the same as in the past. In addition, Kyungjoo, a friend of Soohyun who has borrowed her wig, is savagely murdered, and now Soohyun murmurs unintelligible words. Something is happening to Soohyun and Jihyun is afraid of her lovely sister. And the curse of the wig falls on the sisters…. A horror movie does not necessarily have to be bloody in order to be scary. Pools of blood only make it more messier and more of adding to the gross element rather than the scary factor. Well, just good to see that this horror flick belongs to this less breed. Unfortunately, its evident weakest link was the unusually quick but important flashbacks of the past, that are trying to explain to the audience what actually happened and how the wig was cursed or possessed by the spirit. All these occurred in a short time span that is less than one-third of it. And to think that this time span was spilt between reading the subtitles and catching up with the moving scenes. Well, get your remote control ready to “rewind” and watch these few vital scenes again to understand it. This is definitely the advantage of watching this movie on DVD. It would be a test of your observant skills if audience were to watch this movie without reading the synopsis first. Focus on the elder sister, Ji-hyun. Although I have glanced through the synopsis without actually remembering the details, I didn’t notice something was amiss about her till somebody probed me about it. Poor Ji-hyun. She is an even more pitiful character than her younger sister, Soo-hyun who is battling with her cancer illness. Given a choice between couple relationship or sisterly love, which is more important? Half a star awarded for the actresses’ performance. At least the script allows them to express feelings of sadness, loss etc other than merely fear, shock and screams. The dvd comes equipped with only Korean Dolby Digital 2.0. Not the best but nevertheless, capable enough to bring out the sound effects. There isn't any visible artifacts being spotted and the rich tones of dark shades are perfectly captured on this disc transfer.